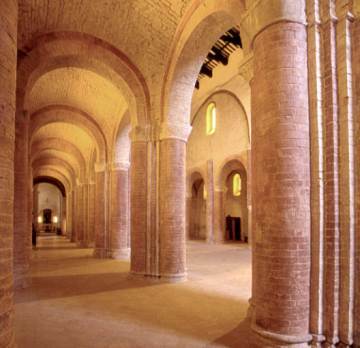 A noble old abbey, a nature park and some of the Marche's best Roman remains lie just south of Macerata. The serene Abbazia di Fiastra (open May-June weekends only; July-Sept daily) is one of the great Cistercian abbeys founded under the wing of Clairvaux in France. Apart from its splendid setting, it has delightful frescoes by the Salimbeni brothers and a fine Renaissance cloister. Part of the building now houses an archeological museum with finds from nearby Urbs Salvia, and a collection of antique rural artifacts. The whole area is a Riserva Naturale, an idyllic spot for country rambles that is carefully protected by the World Wildlife Fund. A few km further south stand the remains of Urbs Salvia, a city founded in the 1stC BC and, like so many of the Marche's Roman towns, wiped out by Alaric in 408. For once this is an archeological site with things you can actually see - the amphitheatre, built in the 2ndC AD, is one of the region's most conspicuous Roman ruins.